For the 35th year in a row, thousands of people stood for hours in a blocks-long line Tuesday for an annual South Los Angeles turkey giveaway, the founder of which died last year but the spirit of which continues to thrive. The Los Angeles Reinvestment Foundation, carrying on the legacy of Ellsworth E.J. Jackson, handed out thousands of boxes containing all the fixings for a Thanksgiving dinner, to the delight of needy families looking for a way to brighten the holiday. “I’m so happy and grateful,” one woman told CBS2/KCAL0 as she picked up her box of food. E.J. Jackson was the owner of Jackson Limousine Service, which is well- known as a chauffeur to the stars. But Jackson is better known for his annual turkey giveaway. The event began in 1982 when some area senior citizens who couldn’t afford Thanksgiving holiday meals approached Jackson, who responded by buying 100 turkeys and creating the E.J. Jackson Foundation. The next year he bought 200, and the next he bought 500. The giveaway grew into an annual community event. 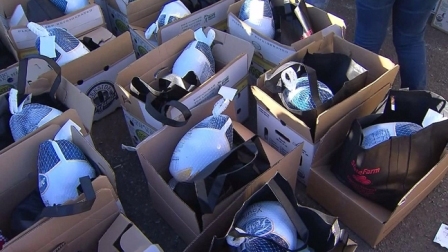 More than 10,000 turkeys will be passed out by the time Tuesday’s event is finished. The dedication and continued efforts by volunteers and donors to make the event happen served as an inspiration to Jackson’s son, Tyron.